For more photos, go to www.CentralCityNews.SmugMug.com. The Central City News provides objective, award-winning coverage of news about the City of Central. It is published at the same time as its sister publication, the Capital City News, which covers Baton Rouge. The combined circulation this week is 14,500 copies with total readership of the hard copies estimated at over 45,000. Last month, the Capital City News print edition on-line was read by 25,200 people. Total readership estimated at over 70,000. 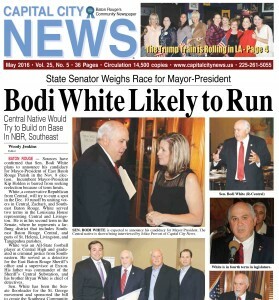 The Central City News and Capital City News are published on the 1st Thursday of the month. The Graduation Edition is published on the third Thursday of May. • Recent honors and awards: Capital City News: 1st Place in Louisiana for General Excellence, Louisiana Press Association. Central City News: Named one of four Best Community Newspapers in America by National Newspaper Association. Twice winner of the Freedom of Information Award, the highest award given by the Louisiana Press Association. 1st Place for Best Investigative Reporting, Best News Story, Best News Photo, Best Regular Column, Best Graphic Design, Louisiana Press Association. • To reach the office or place a display or classified ad, call 225-261-5055. Visit our websites: www.centralcitynews.us (website for Central City News), www.centralcitynews.net (archives of Central City News and Capital City News), www.capitalcitynews.us (website for Capital City News), www.CityofCentral.com (information about Central), and http://www.centralwildcat.com (website for The Central Wildcat, the official newsletter of the Central Community School System). On Facebook, “Like” Capital City News, Central City News, The Central Wildcat, St. George Leaders, Capital Republican (Republican and conservative news in Baton Rouge area), Chamber of Commerce of East Baton Rouge Parish, and Liberty Today (our national conservative news site).